Expedia is offering a couple promotions that might be of interest to New York City travelers. The most exciting is a bunch of really good discounts on cruises from New York. They’re featuring deals on cruises to the Caribbean and the Bahamas with Norwegian and Carnival Cruise Lines. They also have a cruise with Holland America Line that goes up to New England and Canada. Use the link below to see the deals page. And if you book travel plans with Expedia, you can take advantage of their other offer – double Expedia Points. Find your Reward: Save on fall trips and earn Double Expedia Points! – Expires 10/31/13. 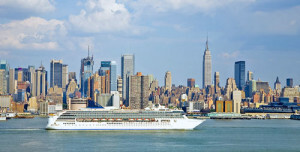 For a calendar of cruises schedule to depart from New York, visit New York Cruise Guide. They also have some recommendations on hotels close to the cruise terminals.